I encourage you to simply just play this part. It doesn’t really require a guide, but I’m doing it for sake of completeness. This might be the coolest mission in the game. Enjoy It! Objective: Put on the respirator and follow Tyler Freeborn into the fog. Objective: Find the source of the song. After awhile, you’ll pass out and wake up elsewhere. Drop over the side, then head into the house. Through the house, down the stairs, and out the back. I took a right, to the flashing light… From here…. The mission was so awesome at this point, I stopped writing! You guys just need to experience this! Well, I had intended to let you guys figure out this part on your own, but too many requests for the ‘puzzle’ solution. Use the respirator on Tyler Freeborn to advance the mission. Objective: Listen to Tyler Freeborn’s last recording. The recorder is in his hand, use it to complete the mission! Are the “Tyler freeborn” missions repeatable, or just one time events like the main story? I hate trial and error puzzles. Why did you leave the solution out? There are 5 tires, I eventually blindy accidentaly stumbled upon the fkn solution, see previous post, the 2 closest to the edge should be dark, the other 3 lit up. OMG this mission was A M A Z I N G! The Vanishing of Tyler Freeborn was outstanding!!!! How the heck do you do Tier 3? Just keep running around? Ok, I just finished this chain. So you know, my talismans are ql lvl 5-6 and weapons are 7 and 8. What an awesome mission! I’ve updated the guide to include a picture of the tires puzzle. The tires “puzzle” is easily solved by simple observation and a bit of logic. If you mentally number the swinging slabs from nearest to farthest, you will have slabs 1, 3, 5 & 7 on your left, and 2, 4 & 6 on your right. Then mentally letter each tire, starting with the closest one to you as you enter the area and proceeding clockwise from there. This gives you tires A, B, C, D & E. Activate each tire in turn and simply watch which slabs move- you will see that tire A moves slabs 1, 2 & 3; B moves 1, 4 & 5; C moves 2, 3 & 4; D moves 4, 5 & 6 and E moves 1, 6 & 7. 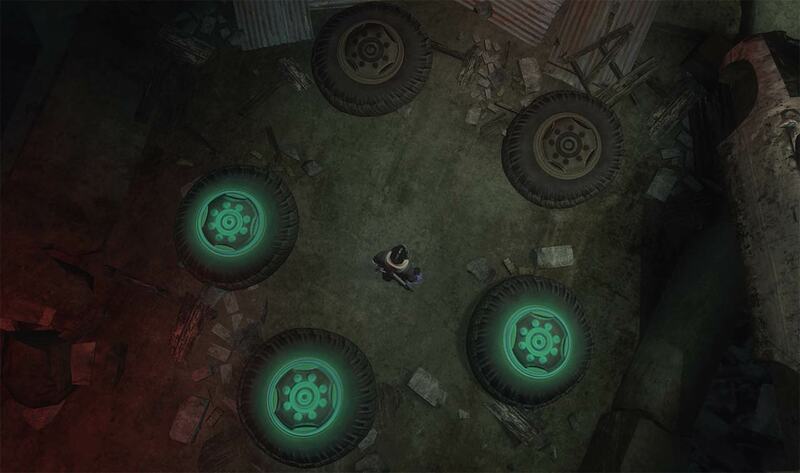 Since all the slabs EXCEPT 7 are moved by more than one tire, start by activating E to move 1, 6 & 7 into place, knowing that no other tires will displace 7 now since E is the only tire that moves it. Now activate B and watch as 1 returns back to its original position while 4 & 5 move into place. You now have 4, 5, 6 & 7 in place, leaving only 1, 2 & 3 needing to be moved. Since A moves (D’OH!) 1, 2 & 3, hit it and run across the slabs. in this quest the game dont give me the mask to enter the fog and i die when i go inside..what i need to do? my respirator went missing and I die in the mist… WTF? What’s that side mission that appeared when you killed the mob by Tyler’s corpse? I skipped the lights when I went into the fog last time I did this mission, and just walked straight ahead instead. Stumbled upon a couple of draug running around, and just before I fainted I saw something that looked like giant beating heart on the ground. Just a cool sidenote I haven’t seen before when I’ve followed the lights.